A Lion took a Wolf and a Fox with him for a hunting mission. They successfully hunted down an Ox, an Ibix and a rabbit. The Lion asked Wolf how he would like to distribute the booty. 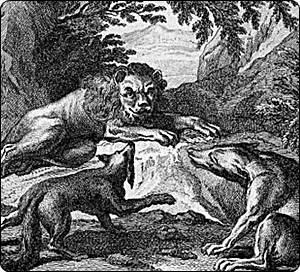 The Wolf suggested that based on sizes of the preys, it’s reasonable that Lion keeps the Ox, Wolf gets the Ibix and Fox being smallest should be sufficient with rabbit. The Lion was enraged on such distribution. “How do you dare talk of I and You, and Mine and Yours in my presence.”, he thundered and hit a fatal blow to Wolf. Then he returns to fox to do distribution. “Your Highness, keep the Ox for dinner and Ibix for lunch and if you feel pekish in middle, the rabbit is there at your pleasure”, responded the Fox. The Lion is pleased at Fox and asks where she learned such wisdom. The fox replied that that the aftermaths of wolf’s response taught him the lesson. The Lion roared, “Behold! When there is no I or You, or Mine or Yours that remains anymore, you are no longer a feeble Fox. You are a Lion! Hence all 3 preys are granted to you!”. Within above story, there is also threaded another story of person who knocks at beloved’s story and denied access. Once a man came and knocked at the door of his beloved. The Beloved replied, “Go away as there is no room here for any ‘raw’ at my wellcooked dinner. Nothing but fire of separation can cook the raw one and cleanse him from hypocrisy! Kept burning with sorrow due to his beloved’s absence. And approached the house of his beloved again. Fearing that some careless word might leave his lips. The friend said, “Since it is Me, let ‘Me’ come in.